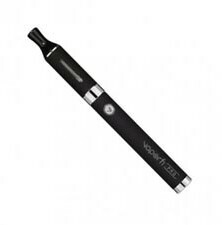 VaporFi (formerly known as Vapor Zone) has quickly made quite a name for itself in the e-liquid and electronic cigarette world. Their e-juice selection is, quite frankly, amazing – and they have a wide variety of tanks and mods aimed at novice, intermediate and experienced vapers. Here we focus on the VaporFi Pro, which is the company’s terrific “entry-level” vape pen. It ranks second in our ratings of tank/EGO systems. The VaporFi Pro has a fairly sleek look to it; it’s all matte black from the battery to the tank to the mouthpiece (which is glossy black). However, if you choose the “Pro Starter Kit (in Colors)” for around the same price, you can customize your kit so that the tank and battery are in one of nine other colors, including stainless steel. The included tank only has a small window to see how much e-liquid is left; while that might be a stylistic advantage, we find it inconvenient. You can purchase a clear tank as an accessory instead, or upgrade for another $10 to the Pro Platinum kit which includes a glass clearomizer. OK, we’ve talked about a few options, but what’s in the VaporFi Pro kit? It comes standard with one 1.5 ml tank, a 650 mAh battery, three additional 2.2 ohm atomizers, a USB charger and an AC adapter. If you get the Color Pro Starter Kit, you can upgrade to a 3 mL tank for an extra $3 and to a 1000 mAh battery for another $3, only sacrificing the extra atomizers in return. It’s a good deal for heavier vapers who don’t mind the extra heft and length, even though the standard tank and 650 mAh battery did us just fine for a day of fairly regular vaping. The construction quality was top notch; VaporFi is a sister company to South Beach Smoke which has a good history of producing quality products, so we weren’t surprised. We don’t want to say we’ve left the best for last, since the unit is pretty damn good on its own. But visiting the VaporFi e-liquid online store is like being a kid in a candy store. Yes, their liquid is excellent-tasting and made in the USA, but what really makes your eye pop is the selection of dozens and dozens of flavors, which can also be combined and custom-blended in their “vapetender” for nearly 60,000 different possible combinations. It can be fun to “mix your own” eliquid flavors at home, but it’s even more fun (and a lot less messy) to do it online and have a 30 ml bottle (or more) show up at your door. You can also between 70/30 or 50/50 PG/VG bases and strengths all the way up to 36mg. It can be hard to stop playing and actually make a purchase, but when you do, the end result is delicious. The VaporFi Pro is definitely the second-best vape pen we’ve reviewed, particularly when you go with the “Color Kit” and take advantage of the inexpensive tank and battery upgrade. We use it all the time, and think it’s a terrific product.